The Catalan president, Carles Puigdemont, played for time today, suspending the declaration of independence mandated by the referendum in order to continue negotiations with the central government of Spain, the European Union, and—presumably—hardliners in his camp who desire to proclaim Catalan independence unilaterally. As these two sides face off, jockeying for position on the world stage, how should we relate to this conflict? We’ve translated another text from anarchists on the Iberian peninsula addressing this question. On the Spanish side, we see old-fashioned brute force covered with the usual thin veneer of legalism. When the Spanish minister of the economy says “This is about a rebellion against the rule of law, and the rule of law is the foundation of coexistence,” he is issuing the sort of veiled threat that emperors have always used to keep their vassals in check. The police and military forces converging in Catalunya are not an exception, but the rule on which this rule of law is based; there would be no Spain if not for the sort of violence with which Spain tried to block the referendum, and no other states either. This explains the fascist flags and Nazi salutes in Madrid, and the spokesperson for the ruling party in Spain suggesting that Puigdemont may end up like the last Catalan President to declare independence, who was murdered by a fascist firing squad with the assistance of Nazi Germany. When democracy does not serve to legitimize the state but threatens to split it asunder, partisans of pure, unmediated violence will always come to the fore within the ruling party. On the Catalan side, we see a large number of courageous people from all sectors of society coming together to struggle heroically for a misguided and counterproductive goal. The independence movement brings together left-wing and right-wing nationalists with capitalists seeking to increase their control of the market, socialists who believe that a Catalan state would pass better laws, and anarchists simply concerned with defending their neighborhoods from the Spanish police. The politicians within this movement are likely to disappoint rank-and-file participants by not following through on their promises, but the problem goes deeper than this. The bigger problem is that establishing a new state is one of the least efficient ways to pursue the laudable goals that the best parts of the independence movement espouse. Self-determination is not achieved through government; it is the opposite of government. If the objective is to promote autonomy and create a more egalitarian society, this will not be achieved by passing and enforcing laws, however liberal, but by dispersing power throughout participatory social movements capable of opening spaces of freedom and solving their own problems directly. Those who have traded their vision that “another world is possible” for the slogan “Un altre país és possible” (another country is possible) may believe themselves to be engaging in realpolitik, but routes that appear to be shortcuts often turn out to be ways of getting more rapidly to the wrong destination. One does not simply advance incrementally towards stateless freedom by breaking states into smaller pieces. Everything that appears to temper or divide up the power of centralized government also serves to stabilize and legitimize it. The best way to defend ourselves against oppression is not to try to put another government in place over us; it is to build the capacity to defend ourselves against all who aspire to govern. Social change is never easy; it requires sacrifice and hardship. Let’s make those sacrifices and undergo those hardships in order to address the roots of our problems, rather than to help the latest wave of opportunists take power. The unfolding conflict between the Spanish and Catalan governments calls to mind the predicament anarchists found themselves in during the Ukrainian revolution, which pitted fascists and nationalists against an oppressive regime. When the struggle came to a head, anarchists were forced to take the streets alongside fascists rather than suffer the crackdown that would have ensued if the uprising failed and the regime survived; yet they were forced to fight behind nationalist and fascist banners, as fascists outnumbered them and attacked them when they tried to express their own political objectives. This worst-case scenario occurred because Ukrainian anarchists had not been able to establish a third front within the social unrest from the outset, rejecting both nationalism and the regime. Some outside Spain are calling for anarchists to support the bid for independence on the grounds that it is a cut-and-dried struggle of authority against the people. In practice, this would mean doing on purpose in Catalunya what anarchists were forced to do in Ukraine. On the contrary, we believe that, presented with a choice between two bad options, anarchists should follow advice of the Yiddish proverb and choose the third. We should take the streets to defend our neighbors and communities against police and oppressive governments, but we should always make it clear that we do this out of opposition to all police and governments, however unpopular this is. This holds open the possibility that later, when people are disappointed by the success or failure of the nationalist movement, they will be able to consider the anarchist alternative. Unfortunately, this will not be the last time we have to face this challenge. Civil war is on the horizon in many different parts of the world. As soon as human beings are divided into separate polities according to ethnicity, religion, or other markers of belonging, war inevitably follows as the rival powers contend for territory. Because ethnic purity and cultural homogeneity are myths, the lines on which such divisions should be drawn are always blurry. Nationalists of every stripe will be eager to enlist us in these conflicts. When they are fighting against an oppressive ruling force, we may find ourselves beside them, but this only makes it more important for us to retain our autonomy and take pains to distinguish our agenda from theirs. 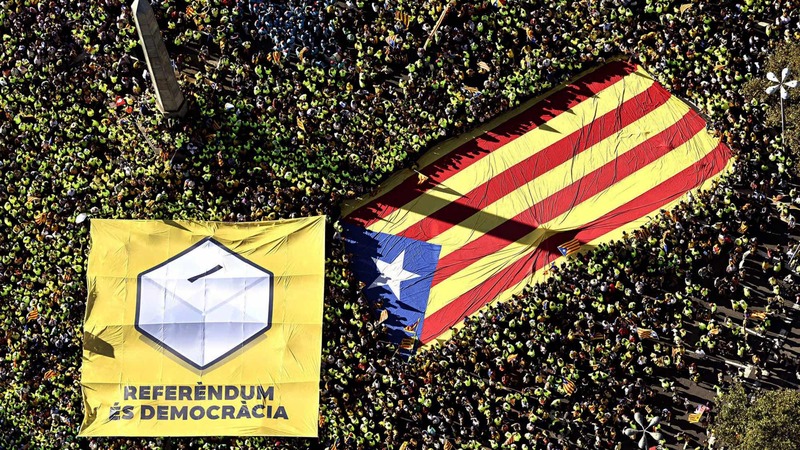 To learn more about how social movements in Catalunya went from being ungovernable to calling for an independence government, read “From 15M to Podemos: The Regeneration of Spanish Democracy.” To learn how Catalan anarchists regarded and participated in the struggle during the referendum, read Anarchists on the Catalan Referendum: Three Perspectives from the Streets. For more discussion of the relationship between nationalism, democracy, and the state, read Democracy, Red in Tooth and Claw On the Catalan Referendum: The Old State, a New State, or No State at All? Our comrades in former Yugoslavia, having lived through a civil war in which ethnically defined nationalist blocs split apart and fought for territory, have watched the situation in Catalunya with apprehension. They recommended that we translate and publish the following text, “Reflections on Catalunya, September 2017,” comprised of the correspondence between two veterans of the anarchist movement in the Iberian peninsula, Tomás Ibáñez and Miquel Amorós. In the words of Tomás Ibáñez, One never takes power. It is power that takes us. When such drastic changes happen in Catalunya as the ones that have occurred since the massive demonstrations of May 15, 2011, it is quite difficult not to experience some perplexity. What happened so that some of the more combative sectors of Catalan society went from “surrounding the Parliament” during the summer of 2011 to wanting to defend the institutions of Catalonia in September of 2017? What happened so that these same sectors went from facing the autonomous police force of Catalonia—the Mossos d’Esquadra—in the Catalunya square, and from reproaching their atrocities, like those suffered by Esther Quintana1 and Andrés Benítez,2 to applauding their presence in the streets and fearing that they may not possess full autonomy? What happened so that some of these sectors went from denouncing the government for its antisocial policies to voting for its budget? But also, what happened so that certain sectors of anarcho-syndicalism went from stating that freedoms have never been obtained by voting to defending the possibility for a referendum to be given to the populace? We could add many more questions to this list and one could give multiple answers to each of the questions I’ve asked. We could cite factors like the decline of the regime of ‘783; the economic crisis and the austerity measures that were imposed, rendering life ever more precarious; the establishment of the far-right in the Spanish government with all its authoritarian policies and curbs on civil liberties; the scandalous corruption within the majority party, and many more. However, I think it would be naïve not to take into account the extraordinary rise of nationalist attitudes. Without a doubt, the rise of nationalism is connected with the factors I mentioned, but it also also received a lot of fuel from the Catalan government and Catalan public television. Several years of persistent nationalist propaganda have inevitably shaped how people think, and the strategies to expand the base of Catalan nationalism have been extraordinarily intelligent. This narrative constructed on the basis of the right to decide, on the basis of the image of the ballot box and the demand for the freedom to vote, served to conceal the fact that all along it has been an apparatus of the government working to promote this tale. Today, the starred flag (red or blue) is, without a doubt, an emotionally charged symbol under which the masses mobilize. And precisely this aspect should not be overlooked by those who, without being nationalists, see in the mobilizations in favor of the referendum an opportunity that anti-authoritarians should not pass up in order to open up spaces of potential that, if not revolutionary, could at least serve to agitate society. And so they throw themselves into the battle between the governments of Spain and Catalonia. They should not take this lightly because when a struggle includes a strong nationalist component, and this is, without a doubt, the case in the current conflict, the possibilities for emancipatory change are strictly null. I would like to share the optimism of the compañeros who wish to open up cracks in the current situation in order to make emancipatory paths possible. However, I cannot shut my eyes to the evidence that popular insurrections and movements for social rights never extend across society regardless of class: they always find the dominant classes circling their wagons on one side of the barricades. While in movements for national self-determination, like the current movement, there is always an important interclass component. These movements always connect the exploited and the exploiters in pursuit of a common objective, which never turns out to be the abolition of social inequalities. Consequently, as history shows, movements for national self-determination always end up reproducing class society, subjugating the common people once more after they have served as cannon fodder to advance these struggles. This does not mean that one should not fight against dominant nationalisms with the aim of destroying them, but one has to do this while constantly denouncing rising nationalisms, instead of converging with them under the false pretext that this common front could create the possibility of spreading emancipatory ideals and isolating those who only wish to create a new national state that they could control. Let there be no doubt: these travel companions will be the first ones repressing us as soon as they don’t need us anymore, and we should have already learned not to let them off the hook. Your “untimely perplexities” are the greatest exponent I have read of common sense and of the revolutionary seny4 which should reign not only among anti-authoritarians, but among all who wish to abolish this society rather than managing it. And back in the day, there was no shortage of those who jumped on the Podemos bandwagon or the platformist bandwagon and changed their class struggle attire for the clothes of the new citizenry. It is characteristic of philistine anarchism, in the face of any minor historical dilemma, to opt for playing the game with the established Power. The Spanish Civil War is a clear example of this. Confusion, the irresistible attraction of the racket [i.e., taking positions within the state], losing class-based structures, the lesser of two evils, the enemy of my enemy, whatever. The final result is this: a mass of slaves who will serve any outside cause and a bunch of unhealthy egos in the style of Colau6 or Iglesias7 who would pay to be sold. Black storms stir up the skies and dark clouds block our sight. Lets try to disperse them. The question one should ask oneself is not why one local sector of the dominant class should decide to resolve its differences with the State via street mobilizations, but rather why a considerable portion of the population with opposing interests, mainly youth, acts as the theatrical scenery and striking force for the caste which has inherited Catalonia; a caste that is classist, catholic, corrupt, and authoritarian at that. The game of Catalonian patriotism is not difficult to disentangle, and those who promote it and benefit from it have never sought to conceal this. The process in favor of national independence has been a daring class operation. The consolidation of a local caste associated with economic development demanded a qualitative jump in national autonomy. The refusal of the central plutocracy to dialogue, in other words, to transfer responsibilities, mainly financial, blocked the ascent of this caste and reduced its influence and political capacity with regards to some businessmen, industrialists, and bankers who were willing to be led by a sovereign class in order that they could they could triple their profits. The decision to go head-to-head with the Spanish state meant a radical rupture with the pacts of political Catalanism. They weren’t too serious. In other words, the goal was never a unilateral declaration of independence, since this caste only hoped to force a new negotiation from a more advantageous position. However, since it needed to appear as though that was the intention, it needed a well-oiled apparatus of agitation in order to inject a jingoistic mysticism into the public that could boil up in a controlled manner in the caldron of identity. And the mobilization became a reality. It was quite a sight. Armed with the marketing of identity, this pro-independence demagoguery was able to perpetuate itself within a democratic citizenry. The demagogues were able to take these masses out to the streets, because the people were too domesticated to go out on their own accord. With great skill, they played on the repressed emotions and gregarious feelings that remain hidden inside the servants of consumerism. In other words, they used alienation to their own advantage. In my opinion, they have achieved their goal, and the ruling state caste is much more willing to modify the post-Franco constitution so that it may better suit the Catalan caste. Although for that to succeed, it might have to sacrifice some figures along the way, perhaps including Puigdemont8 himself. This seems to be suggested by the powerful representatives of big Capital, such as Felipe González, for example. Nationalism is controlled by con men, but in itself it is not fraud. It is an emotional reaction to a situation that is frustrating for a lot of people whose agency has been thwarted. It doesn’t function in a rational way, since it is not the result of reason; it’s more like a psychosis than a stirring towards liberation. To understand the emergence of patriotism in Catalan society, one must study mass psychology, and for that Reich, Canetti, or Nietzsche are more useful than theoreticians like Marx, Reclus, or Pannekoek. The conviction and enthusiasm of the crowd do not emerge from cool-headed, logical reasoning, or from rigorous social or historical analysis. They have more to do with finding an emotional release without risk, the feeling of power that crowds produce, the fetishism of flags and other such symbols, the virtual Catalan spirit of social networks—the characteristics of a rootless, atomized, and déclassé mass, lacking their own values, goal, or ideals, predisposed to agree with whatever is given to them. Colonized by the market and the State, everyday life is full of latent and internalized conflicts, endowed with an excess of energy that surfaces in the form of individual or collective neurosis. Nationalism, of any kind, offers an excellent mechanism for channeling these impulses which, if they were to rise to consciousness, would constitute a terrifying force for revolt. Nationalism divides society into two paranoid blocs, artificially confronted by their obsessions. Material, moral, cultural interests do not count. Nothing to do with justice, liberty, equality, or universal emancipation. The Catalan people is something as abstract as the Spanish people: each is an entity that serves as an alibi for a sovereign caste with its famously repressive police. A “people” is solely defined against any power that does not emanate from it or that separates it from itself. So it follows that a people with a State is not a people. You might agree with me that history is made by common people via assemblies and organisms born from assemblies, but as things are right now, history belongs to those who manipulate it most effectively. What these people do is provide the popular frame for a bad theater play in which we can see an all-too-typical distribution of power. Anyone may make their own calculations and navigate inside or outside of the nationalist waters, in their tame turbulence, but you must never lose sight of the heart of the matter. Esther Quintana is a journalist who lost an eye as a result of being attacked by the Mossos in 2012. Andrés Benítez died in 2013 after being beaten by a group of Mossos. The current Spanish constitution and political regime, which was instituted in 1978 after four decades of right-wing dictatorship under Franco. Seny is a form of ancestral Catalan wisdom or sensibleness. It involves well-pondered perception of situations, level-headedness, awareness, integrity, and right action. Ricardo Mella was one of the first of the writers, intellectuals, and anarchist activists of the late 19th and early 20th centuries in Spain. Ada Colau is a Spanish left-wing representative and, since June 13, 2015, Mayor of Barcelona, the first woman to hold the office. Colau was one of the founding members and spokespeople of the Plataforma de Afectados por la Hipoteca (PAH) (Platform for People Affected by Mortgages), which was set up in Barcelona in 2009 in response to the rise in evictions caused by unpaid mortgage loans and the collapse of the Spanish property market in the wake of the 2008 financial crisis. Pablo Iglesias Turrion is a Spanish politician who has been the Secretary-General of Podemos since 2014. Before then, he was a lecturer in political science at the Complutense University of Madrid. He hosts the online programs “La Tuerka” and “Fort Apache” and frequently appears in Spanish political TV shows. Puigdemont is a Catalan politician and former journalist. He is the current President of the Generalitat of Catalonia. This entry was posted in Commentary, News blog and tagged anarchism, catalonia, democracy, Miquel Amorós, Tomás Ibáñez. Bookmark the permalink.